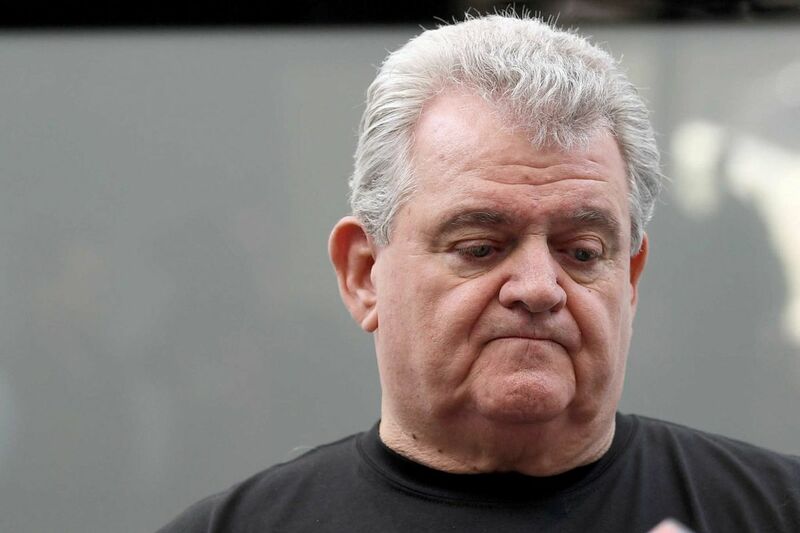 Bob Brady, the larger-than-life leader of Philadelphia's Democratic Party, announced Wednesday that he is not running for reelection to the U.S. House. After a year in which he was under the cloud of a federal investigation, he revealed the news in a way that seemed all too perfect for the decades-long party boss: Wearing a long-sleeve Eagles shirt, Brady told ward leaders at a meeting at the Democratic City Committee's headquarters that he was calling it quits. A platter of hoagies from DeNofa's in Northeast Philadelphia was served for lunch. Brady's announcement could reduce the political clout of Philadelphia's delegation, which besides Brady has two congressmen with little to no seniority in an election year in which many observers think Democrats could take back control of the House. It will also likely push more candidates to jump into the race to succeed Brady. In fact, a new contender joined just hours after Brady's announcement: Pastor Kevin Johnson. Another, State Rep. Joanna McClinton, told radio station WURD that she was considering a run. And though Brady said he is going to continue as party chairman, some will likely see his announcement as a sign the city's Democratic machine is weakening. In an interview hours before the party meeting, Brady, 72, said his family, as well as his concerns about how a new district map may affect his fellow city congressmen, factored into his decision. "I've been married for 21 years," Brady said. "For 20 of those years, I've been going to Washington four days a week. I need to come back home." At a news conference after the ward leaders' meeting, Brady reiterated that he wants to spend less time inside the Beltway. "All you can do after 4 or 5 o'clock [in Washington] is eat or drink. I don't drink, and I certainly don't look like I need something to eat." Though several candidates announced in recent months that they would challenge Brady in the Democratic primary, he said that wasn't a concern: "I am not afraid of winning." He was also adamant that last year's federal investigation into his campaign finances, which snared two of his closest political aides, played no role in his choice. Brady spent the second half of 2017 under intense scrutiny after it was disclosed that his campaign had given $90,000 to Jimmie Moore, an African American Democratic challenger in the 2012 primary who then dropped out of the race. One of Brady's aides, Don "DA" Jones, has pleaded guilty in federal court. Another, Ken Smukler, has said he will fight the charges. "I've got a complete bill of health from the federal government," Brady said. "They told my attorney I am not being charged. They told my attorney in November. No deal was made." The U.S. Attorney's Office in Philadelphia declined Wednesday to comment on Brady's characterization of its investigation. Brady's lawyers — Ronald Levine and James Eisenhower — were more circumspect and sought to clarify. The statute of limitations expired in January on almost all of the charges that Brady may have faced. "Based on our review of the status on the case and the fact that the statute of limitations has run… we advised him that we don't believe he will be charged," Eisenhower said. Still, the investigation took a financial toll. Brady's latest campaign-finance report, filed Wednesday, showed that he paid $256,799 to three law firms in the last three months of 2017. While the cases wend through the courts, the First District that Brady represents could change. A recent order from the Pennsylvania Supreme Court requires the Republican-controlled state legislature to redraw the 2011 map that set boundaries for congressional districts. Six of Pennsylvania’s 18 members of the U.S. House — a third of the state’s delegation — will not be seeking reelection in November. The 18th District is vacant after Tim Murphy resigned in October amid a personal scandal. Bob Brady, who represents parts of Philadelphia and Delaware County, announced on Wednesday that he would not be seeking reelection, the only Democrat among those who said they would not run in November. Brady said he did not want his status as a local party chairman to influence that process in his favor, to the detriment of his fellow Democratic congressmen from Philadelphia, Brendan Boyle and Dwight Evans. "I don't want to be disingenuous and wait for the lines to be drawn and then decide not to run," Brady said. "To be honest with you, are they trying to favor me? Absolutely they're trying to favor me. There's a lot of [potential] maps that have just two congressmen in Philadelphia." Brady's alleged role in influencing the state's 2011 map was already a headache. Former Deputy Mayor Nina Ahmad, who announced last year that she was challenging Brady, said it was "disgusting" that he had "rallied Democrats to support" the GOP map. Brady, however, said, "I didn't have any input." Wednesday's announcement came as a surprise to many insiders. Former City Controller Alan Butkovitz, who represents the 54th Ward Democrats on city committee, said there was much uncertainty in Brady's district because of the gerrymandering case. "I think the redistricting was the last straw," Butkovitz said, adding there were several strong potential challengers. "Then to top it off you have redistricting and you're going to have [decennial] redistricting in another two years. It's almost like a message from God." State Sen. Anthony H. Williams, a ward leader in West Philadelphia, said Brady told him before the meeting that he has served a long time and that he considered the toll of another term. Bob Brady never received less than 81 percent of the vote in 10 general election campaigns for Pennsylvania’s First Congressional District, and has run unopposed twice. He has also run unopposed in the Democratic primary since 2002. "He talked about his wife, his children, his grandchildren that he wants to have an opportunity to spend time with them without the stress of public office," Williams said. "One of his kids is expecting and he's stuck in Washington, D.C."
Brady, a deal-maker with a leadership post on the House Committee on Administration, was not a policy wonk with a long legislative record of accomplishment. He has also been criticized over the years for serving as party chairman as numerous Philly Democrats, including former District Attorney Seth Williams, were convicted of crimes. But Brady has also been celebrated for helping avert labor strikes, bringing home money, and voting against authorization of the Iraq war. At Wednesday's news conference, Brady highlighted an estimated $15.5 billion — with a "b" — in federal funding that flowed to Philadelphia since he first went to Washington in a 1998 special election. "Those are things that nobody in here knows," he said to the room full of reporters. "Maybe it's my fault that I don't profess it or brag about it." Brady also said he was proud of his recent efforts to help rewrite House rules on dealing with sexual-harassment cases. Those changes, which Brady referred to as the "Me Too Act," would pay for legal representation if a congressional staffer accused a lawmaker of harassment as well as prevent members of Congress from paying settlements with taxpayer dollars, as Rep. Patrick Meehan, a Delaware County Republican, did in a recently disclosed case. Before getting into politics, Brady worked as a union carpenter. He got involved in the Democratic Party after a friend suggested that he do remodeling work for then-Council President George Schwartz. Schwartz mentored Brady, who became Council sergeant-at-arms and a committee person. When Schwartz resigned after being charged in the Abscam scandal, he picked Brady to take his spot as leader of the 34th Ward. Brady became party chairman in 1986. Brady said he would leave it up to the city party to decide if it wants to support a candidate in the primary election for his seat. "We will get together and we will pick the person they think is best to serve," he said. But Brady did not think that selection would be any of the previously declared candidates: Lindy Li, Willie Singletary, Michele Lawrence, or Ahmad. Instead, he suggested Richie Lazer might be a good fit for the job. Lazer, who serves as Mayor Kenney's deputy mayor for labor, has been strongly rumored to be interested in seeking the seat since November. Brady said reclaiming the chairmanship of the Administration Committee if Democrats retook the House was not a strong enough lure. "How much blood do you need?" he asked. "I'm 72 years old. Am I going to be 82 years old? I don't know."